Tater is one of more than 40 cats rescued from a hoarding situation in December. When you walk past his suite, you may not even notice he’s in there. 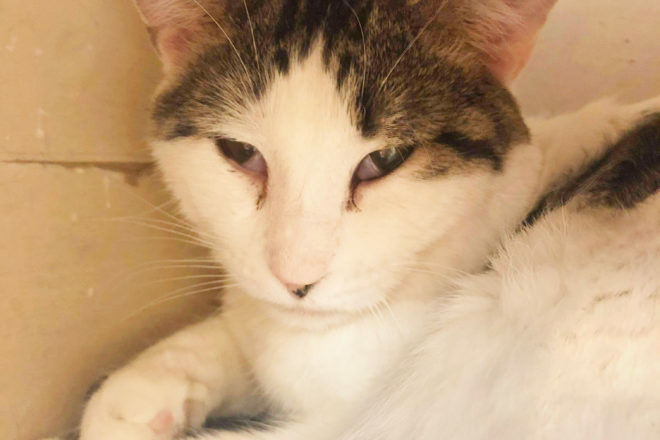 Likely hiding in his cubby, this timid, one-year-old boy is still learning what it’s like to have positive interactions with people, but his appreciation for affection is obvious when he closes his eyes and leans into your hand for a scratch behind his ear. Tater needs a quiet home with a patient guardian who will show him how wonderful life can be with a loving family. Like all cats at the Wisconsin Humane Society (WHS), he has been neutered, vaccinated and microchipped, and you get to name your own adoption fee. The WHS Door County Campus is located at 3475 Park Drive, across from Cherryland Airport in Sturgeon Bay. The campus is open for adoptions 12-6 pm Monday, Wednesday and Friday; and 12-4 pm Saturday. For more information, call 920.746.1111.